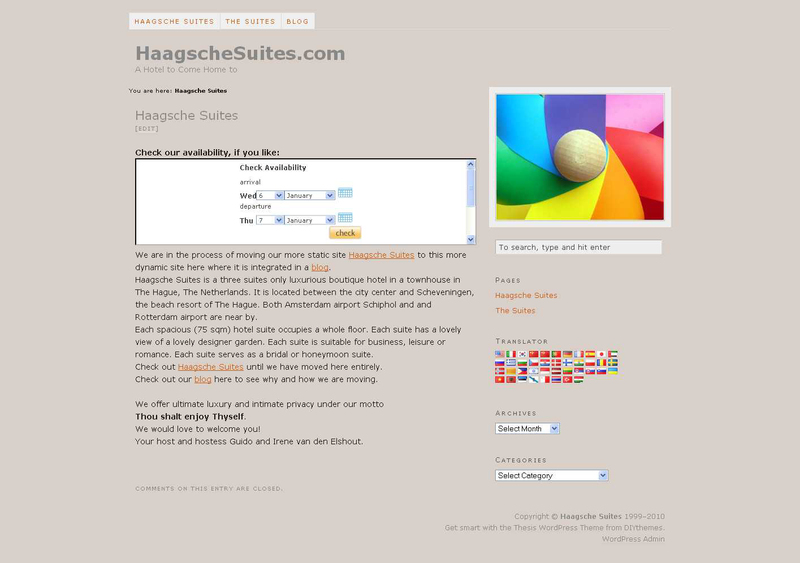 I’ve only one New Year’s resolution: to bring my main project for 2010, the redesigning of the Haagsche Suites website, to a level where it can work stand alone, as soon as possible. After last year’s unfortunate computer crashes, server migrations and now the unfortunate hacking of two of my sites – all costing me too much of my precious time I’m underway again. I’m using the Thesis theme for WordPress which has a couple of wonderful features to change the lay out in a simply way. or there: about the general idea of turning the whole upside down: changing from a dedicated static site maybe with a separate blog into a dynamic site with an integrated blog. Am I stupid? or there: do you know of better alternatives for automatic machine generated translation? or there: the pros and cons of having dedicated “language” urls, or should I install WordPress MU? Maybe you don’t use the good WordPress theme. If the look and feel is not what you expect or would like, don’t worry, because one of Thesis theme’s charms is its huge design flexibility. I can quite easy change the look and feel and make it look and feel like almost any theme. Therefor my first step is to change from static to WordPress driven. Later on during this year I’ll change the lay out a bit more dramatically. The woo themes have a similar flexibilty and there are more out there. 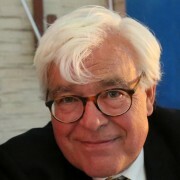 My 3 blogs Haagsche Suites, Happy Hotelier and Chair Blog are now on the Thesis theme. They show layout similarities but also differences. There are many examples of different lay outs/design solutions possible with the same Thesis Theme: see for instance my post Lost under the Hood. A good example of a Hotel site using WordPress (where the blog itself is apart yet) is imo: Istanbul Boutique Hotel :: The Witt Suites. That site is not using the Thesis theme. It use the Metro theme, but I can adjust the Thesis theme easily to get the same look and feel. Good idea! I like the Istanbul example, it show its possible…. Personally I find all these language versions a bit overdone, isn’t English enough, since you have a very “well traveled” client base? Thanks Willem for your input. I believe you are right. Am cutting down on the languages…. I definitely like your new approach to the site, however I would suggest to have a larger image on the start page, to really show what you have. Is SEO included in the site? Next Next post: Wanna Sleep in a Hotel Diaper?